Was Boudin cook-off critique a case of misplaced blame? A white male food writer in New Orleans wonders where all the diversity at Boudin, Bourbon and Beer is in an article published by NOLA.com. More on the palpable irony later. Boudin, Bourbon and Beer (BBB), a fundraising event for The Emeril Lagasse Foundation, became the target of an article last week for its lack of diversity. It was an effort by reporter Todd Price to bring attention to an institutional problem with a timely but controversial headline on the day before Lagasse’s fundraiser. 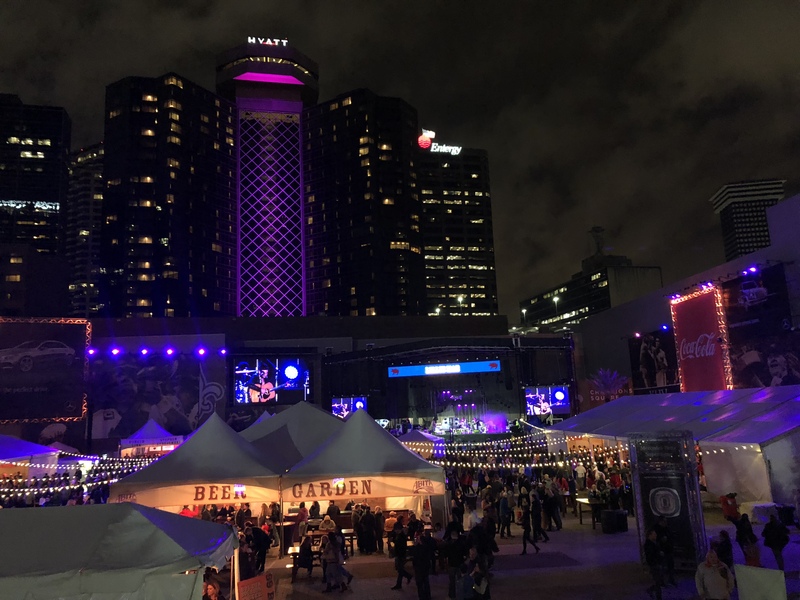 The event, which took place on the night of November 9 in Champion Square, is an annual boudin cook-off with 70 participating chefs from around the country showcasing their takes on the Cajun staple. With each ticket costing $150, the foundation raised $3 million between BBB and its partner event on Saturday night, Carnival du Vin. So, what is Price’s issue? Of 70 chef participants, only one was black. It seemed to me to be a bit of a cheap play, seeing as the event does raise money to fund programming that provides mentorships and education to youth around the country through the culinary arts. Some of the youth who benefit from this programming are at-risk and/or minorities, who now have an opportunity to learn valuable life lessons through the culinary arts, as well as experience a new industry and career option that they otherwise might not be able to enjoy. Some of the programming (such as Café Hope, Café Reconcile and NOCCA) give New Orleans youth the opportunity to receive experience and education that can help them work their way up the culinary ranks – something that is easier to accomplish if you are born a white man. Additionally, the chefs who participate are not sought out by the foundation. Chefs apply and are expected to be able to make 1500 pieces of food, cover the costs of the food, and staff their booths. They also have to either be an executive chef or restaurant owner to participate. The problem isn’t about the lack of black chefs participating at BBB, which raises money for programming for at-risk youth — hopefully eventually helping to make the culinary field more diverse. The problem is the lack of black chefs and restaurateurs. Period. While I don’t agree with the Nola.com article’s simplistic view of a complex issue, and the (to me) manufactured issue it created – an attack on Boudin, Bourbon and Beer that put the foundation at risk of losing supporters for its cause — I do not think that Price is completely wrong. The industry is plagued by a lack of diversity, starting from within restaurants and kitchens and continuing all the way up to the corporate level, and even to the white men who report on it. The James Beard Awards – the most coveted recognition that any chef can receive – has recently been called out for its clubby ways, and has only now made some policy moves to change that, despite the fact that the foundation’s programming focuses on inclusivity. However, those awards have long been guilty of institutionalizing this (white) boys’ club. But don’t take my word for it. According to the Bureau of Labor and Statistics, only 9.5% of restaurant managers and 16% of chefs are black, up from 11% the year before. If the requirements to participate in BBB include being the executive chef or owner of a restaurant (so that they can cover the costs), then that’s an even smaller pool of black chefs who would be able to apply. For starters, it is much harder for minority business owners to get funding, so for chefs looking to go beyond the kitchen staff to opening their own restaurants, it’s a much bigger challenge. According to the U.S. Department’s Minority Business Agency, minority business owners are more likely to pay a higher interest rate, receive lower loan amounts, or be denied on their loan applications, despite the fact that minority-owned businesses create jobs with good pay and at the same rate as non minority-owned businesses. For these reasons, many minority individuals are less likely to apply for these loans out of fear of being rejected. Also, ever notice all those bank branches and loan officers in St. Roch or St. Claude? Me neither. This is called institutional racism. Going the equity route is not necessarily easier, either. According to the same research, minority-owned businesses receive smaller amounts of investment, and the venture capital funds that do go to minority-owned businesses are highly competitive. That is, if would-be minority restaurateurs can even get access to an investor. Other reasons for the lower number of black chefs include a lack of publicity and recognition (for example, The James Beard Awards), lack of mentors, and discrimination in the hiring process. Many still won’t admit to this, but people tend to hire individuals who look like them, unfortunately. If you examine some of the hospitality groups here in New Orleans, you will notice this lack of diversity within their restaurants. It might be a coincidence, it might be because of a lack of people of color getting into the industry and climbing the ranks, or it might just be the fact that it will take a long time before we see progress within the industry, since the statistics are only now changing. But it’s there. These are complicated issues, and there isn’t one easy solution. Even as the statistics, the awards, programming and inclusivity starts to change within the industry, there remains a long road ahead to making things fair. And when will we get there? When will the industry have made REAL progress? When women no longer feel the need to use the words “girl boss” as a descriptor, and can just work toward being a boss. When black chefs can work toward becoming executive chefs or restaurateurs with investors and bankers who see them as the next big thing in the space, and not a risk. When we stop having to use percentages and statistics to gauge how far the industry has come each year; in fact, when we don’t need statistics at all in this conversation. When each young girl or young person of color can have his or her own role model to look up to – one who looks like them. When minority writers can report their thoughts in an established newspaper and say how they feel about any injustices in the industry, rather than being told what those injustices are by a white man. When people stop attacking the wrong target in an effort to find blame. When people no longer have to fight twice as hard to be recognized because they’re lacking the “right” genitalia or skin tone. When we can say that Nina Compton was the first black woman to win a James Beard Award and not the only one. Only when we can be honest enough to acknowledge the real issues causing the racial and gender disparities in the industry, rather than creating a new attack on the wrong target, will we come up with the solutions that will make us more diverse and fair. But we also have to acknowledge that there is long way to go. In his article, Price talks to Howard Conyers, a NASA scientist who moonlights as a BBQ pit master with his own PBS Digital Studios show called “Nourish.” He is black, and has decided to not support food events that lack diversity — including Boudin, Bourbon and Beer. At the end of the article, Conyers asks what the young black children participating at BBB will think when they see that “nearly every chef celebrated at BBB is white.” Participating chefs are there as volunteers and donors, not to be celebrated. More importantly, the participating youth also didn’t get to see another role model – a black NASA scientist with his own food show, there supporting their cause. Maybe you don’t have to see it to want it. Maybe not seeing it will light that fire to want to move up within the industry and change it from the inside.